One of the highlights of the holiday season is enjoying one of the many music programs that add so much to the season. 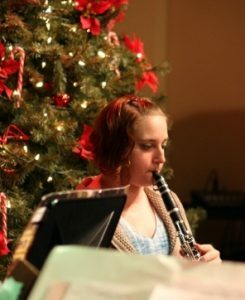 While attending one such holiday concert, I experienced an added touch that really enhanced the evening’s performance. As audience members arrived, they were greeted by several small student groups playing carols. The groups consisted of various instruments and were placed at different locations, both outside the entrance as well as throughout the foyer. I noted they were spaced far enough apart that they didn’t interfere with each other’s performance — all the while keeping the sounds of the season within earshot of the incoming audience. The effect was that of instrumental carolers, creating a festive atmosphere that greatly enhanced the seasonal atmosphere for the evening’s performance. The “caroling” groups consisted of middle school musicians that had volunteered to perform. The carols came from several standard holiday collections that can be rehearsed with full band and are easy enough to perform with little rehearsal time. The director divided the band into the small caroling groups for the concert night. The caroling groups were so well received that they took the show on the road, and used the instrumental groups at various functions around town — playing before choir concerts and singers caroling before band concerts. What a festive addition to holiday celebrations! It not only builds performance opportunities, responsibility and confidence in young musicians, but puts your audience in the mood for a special holiday treat! Music advocate, trombone/euphonium player, private low brass instructor, Concert Band Editor for J.W.Pepper, member of Northwinds Symphonic Band, Kansas City, Missouri.